The Village has released a draft report prepared by the Architectural Design Review Board (ADRB) and the Ad Hoc Subcommittee on Historic Preservation which provides valuable guidance and direction for increasing the number of properties designated as historic landmarks or districts and avoiding the loss of architecturally significant buildings. Since the Ad Hoc Subcommittee on Historic Preservation was established in July, its members and the ADRB have met twice a month. The group is on track to achieve it's mission to deliver proposed recommendations for increasing the number of landmarked properties or districts under the Historic Preservation Ordinance by October 31, 2015. The report contains the details and methodology used by the group to prepare an amended Historic Preservation Ordinance, improve public awareness, and develop incentives to encourage property owner participation in the landmarking process. 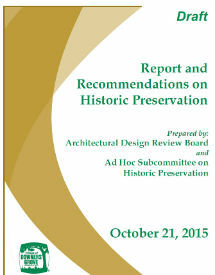 On October 21, 2015, the ADRB and Ad Hoc Subcommittee on Historic Preservation motioned to approve and forward the draft report to the Village Council. The final report will be presented at the November 3, 2015 Village Council meeting.